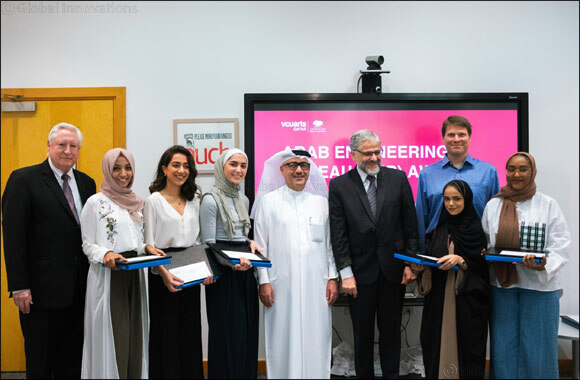 Arab Engineering Bureau (AEB) presented the 2019 awards for Design Excellence, and Creative Achievement and Potential to three graduating and three junior students from VCUarts Qatar at a special event at Virginia Commonwealth University School of the Arts in Qatar’s (VCUarts Qatar’s) Libraries on April 11. AEB’s Group CEO and Chief Architect Ibrahim Mohamed Jaidah, a longtime supporter and friend of VCUarts Qatar, presented the Arab Engineering Bureau Award for Design Excellence in Graphic Design to graduating student Reham Ahmed, and for Design Excellence in Interior Design to graduating students Naurin Najeeb and Yasamin Shaikhi. The awards were instituted by Jaidah to encourage and assist graduating students as they start their careers as designers in Qatar and the region. Jaidah is recognized as a pioneer of a new architectural movement that combines the far-reaching influences of Islamic art with modern styles to create memorable landmark structures that are shaping Qatar. “It is important to us to support creative talent in Qatar, hence we are pleased to offer AEB awards to VCUarts Qatar students in Interior Design and Graphic Design for the 14th year in a row. By supporting creativity, we are playing a small but important role in raising the future generation of leaders in the design industry in Qatar and the region. Also, I am pleased to see some of VCUarts Qatar alumni secure jobs and assume important positions in the government and private sector in Qatar, which is a testament to the quality of education they received at VCUarts Qatar,” he said. The Arab Engineering Bureau Award for Creative Achievement in Graphic Design was presented to graphic design junior Star (Destarte) Prieto, and for Creative Achievement in Interior Design to interior design juniors Raneem Arafeh and Nouf S. Al-Mohannadi. These awards aim to help the junior students recognize their true potential, create leadership and encourage them to continue developing their skills through their senior year. The awards are a major highlight of the academic year for VCUarts Qatar’s students. VCUarts Qatar’s Executive Dean Donald N. Baker said the university was hugely grateful for the continued support from AEB over the past decade and added that the awards recognized the students' commitment to their future careers in what is a very competitive and demanding environment. Besides the awards, AEB and Jaidah continue to partner with VCUarts Qatar by offering internship opportunities to VCUarts Qatar students.